While we only started carrying OPEN Cycles this past fall, we have always been closely following their rise since Gerard and Andy announced their ambitious plans a few years back. Gerard’s pedigree as co-founder/engineer of Cervelo combined with Andy’s industry background was attractive from the start. Over the years OPEN has gone through some trials and tribulations that they’ve shared through their blog including the story of a friend and potential dealer who broke a prototype of the OPEN O-1.0 MTB frame during testing. It has been, perhaps, an auspicious start for the small start-up with a goal of being more than just a company that designs and manufactures bikes. Their approach is refreshing. After following them through their first few years, we are excited to partner in “OPENing up” Utah. Recently we were contacted by Andy Kessler at OPEN and asked if we wanted to share with our friends and family a glimpse of their new bike before it was officially launched at the Sea Otter Classic. Clearly there was no answer other than “YES!” that would be coming out of our mouths. OPEN’s first two frames included a full-out racing hardtail in the O-1.0 and a groundbreaking gravel bike in the U.P. While both of these bikes had instant success, they also had us wondering what would come next. Over the last few years rumors have swirled about a full-suspension frame. We were pretty sure this was what we were going to get a taste of on Friday. However, as the days closed in on our “launch-party” we got word from the OPEN crew that their new bike wasn’t the much anticipated full-suspension, but rather something else. While we were slightly disappointed, our curiosity was building on what else they had to show. The bike brought by Andy did not disappoint. Last Friday Andy debuted the ONE+. It may not be the full-suspension frame OPEN fans have been jonesing for, they are still working on making one, but it is clearly an amazing bike we can’t wait to get out and test on the diverse trails here in Utah. This was Andy’s personal bike featuring an envious build including plus-sized tires (27.5″ x 2.8″) and SRAM’s new Eagle twelve-speed drivetrain. Looking past all the bling of Andy’s build, the new ONE+ frame combines technologies developed for the original ONE and the U.P. to offer up a hardtail mountain bike that can crush a XC race one day and then float through some single track the next. Without an in-depth look, it might appear that this is just their previous hardtail squeezing in some wider tires. This is hardly the case. The bike is designed to be ridden with two different sized wheelsets (29″ with normal width tires and 27.5″ with wider 3″ tires) to really be a go-anywhere platform. The ONE+ features several tricks to minimize weight and maximize ride quality that Gerard and Andy have learned over the years. To make this all possible OPEN also took advantage of some ingenious engineering and SRAM’s Boost spacing to produce a bike with two different, amazing personalities. While we could continue on for paragraphs about this bike’s design we’ll save the tech download for another day. 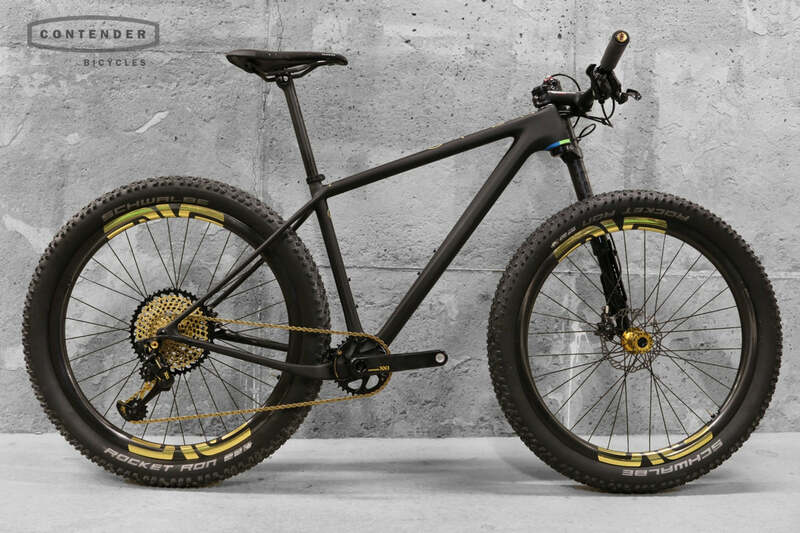 In the end, the ONE+ is a bike that with two wheelsets could literally take the whole-shot at a cross country race Saturday and bomb the trails like a beast on Sunday just by changing out the wheels. Andy’s personal build really show how far you can take this frame if you are obsessive enough to eek out every last gram and build a bike that takes full advantage of the ONE+’s impressive engineering, and really helps to exemplify how obsessively Andy and Gerard think about building the ultimate bike. While we aren’t sure how long the cassette and chain will stay so shiny gold, we are convinced this bike is going to make a splash at Sea Otter for it’s debut. The ONE+ should start arriving around the beginning of June. Update: Open ONE+ frames are now available! Contact us to start building your dream bike today! Hey, sorry. We only had brief access to the bike and were not able to get a weight on the bike at the time we wrote this. Since it is Andy's, of Open, personal build they've done a post on it also, since we saw the bike. Open says 8.6kg (18.9lb), as built.... Pretty good for a bike with 3.0" tires!